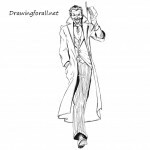 Greeting dear artists and comic book fans! 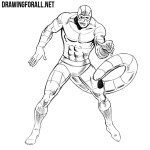 Today we present you a new drawing tutorial about how to draw Mystique. Mystique (Raven Darkholme) is a character from Marvel Comics associated with The X-Men. Created by the artist Dave Kokrum. Since Mystique is a girl, we will apply here the principles of drawing a female figure, which are slightly different from the male figure. At first the chin and the whole face are narrower. Shoulders are equal or narrower than the pelvis. Let’s start adding volume, but first we’ll outline the lines of symmetry of the face. As always, we draw a horizontal line for the eyes and a vertical line in order to find the center of the face. With the help of curved lines draw the torso. 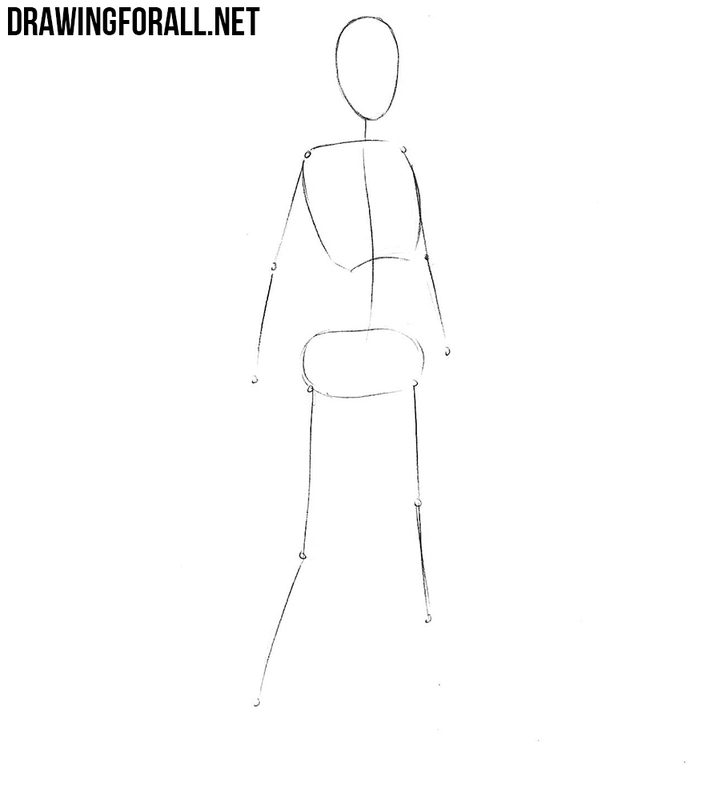 With the help of circles draw the shoulders and knees. Then, using elongated cylinders draw her arms. Draw the hands clenched into fists. Next, outline the legs, which are wide in the hips and taper closer to the knees. Let’s begin adding details. Draw two slightly curved hair lines. On the horizontal line draw almond-shaped eyes and thin eyebrows above the eyes. Draw out the line of the face and form her cheekbone and chin. 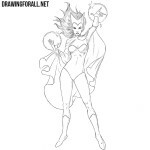 Here we finish drawing the face of the Mystique. Draw out the nose with a vertical line from the second step. Next, draw her lips and go to the next step. So, let’s finish drawing the head of Mystique. Draw the outer contour of the hair. In the middle of the head draw a line of hair parting. With the help of light and slightly curved lines draw a texture of hair. Let’s move on to the torso of Mystique. 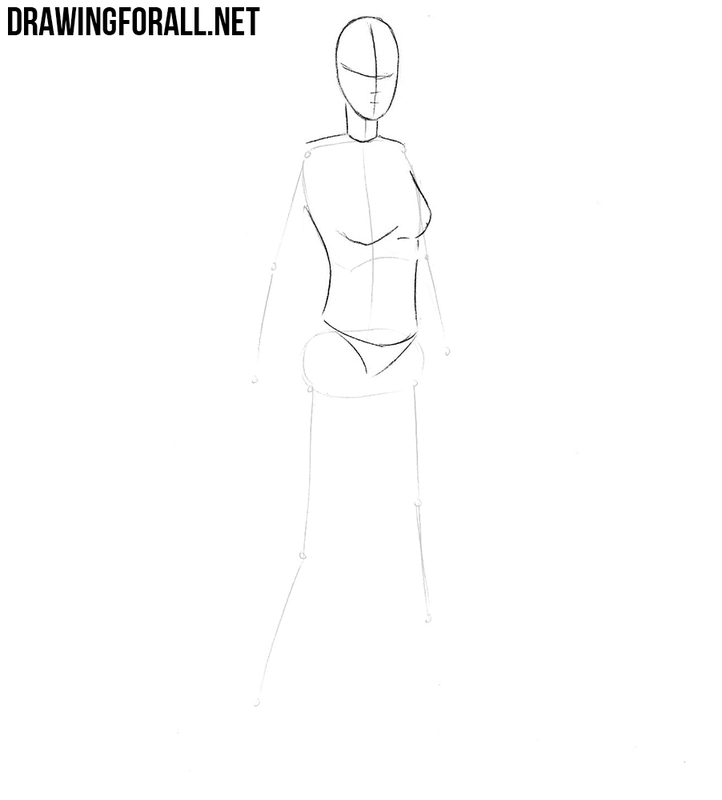 First, draw the outer contours of the torso. 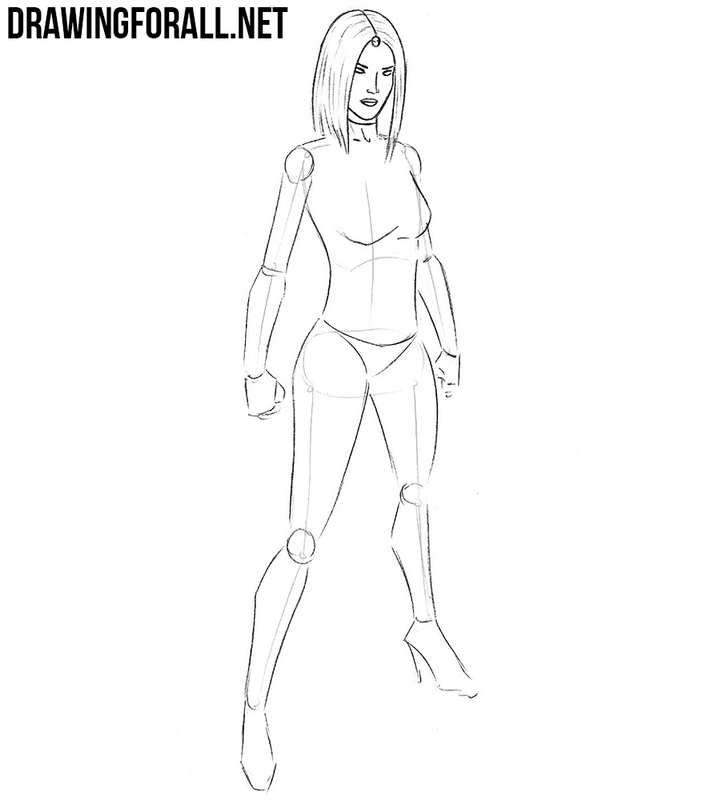 Next, draw the lines of the suit and add a couple of folds. 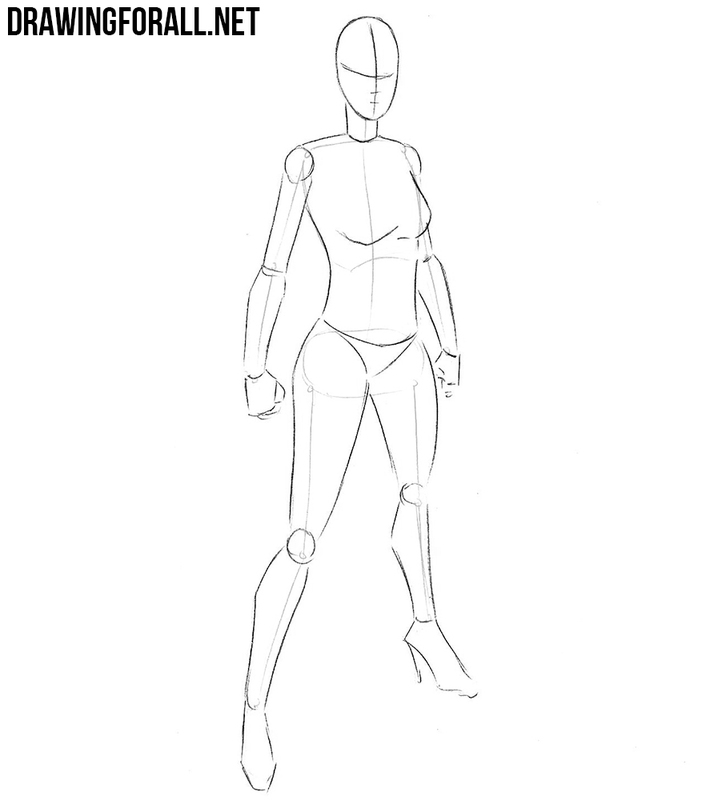 Carefully draw out lines of the arms. Note that mostly women’s hands are more thin and delicate than men’s arms. Now draw glove lines and seams on the gloves. Don’t forget to add some folds. So, let’s finish draw Mystique clothes. Draw a series of small skulls that form a belt. Using long and slightly curved lines draw the fabric hanging from the belt. Finally, we came to the last step of the lesson about how to draw Mystique. Using smooth and slightly curved lines draw the legs, considering all the curved of the muscles. Draw lines of shoes. 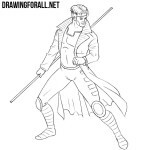 Although we drew Mystique in the style of comics, but we did not add shadows. If you want to add shadows, visit the lessons about Beast or Punisher – we tell how to do it there.